You are to be congratulated on your excellent entries to the 2011 Sarah Mook Poetry Contest. What trouble I had this year in deciding the winners! Because your work was advanced on all levels, my efforts took a longer time than usual to make the final decision. Know that your poems were read with care and attention to detail. I enjoyed every one of them! This third place poem in this age group is an extended metaphor concerning trust. This poem's brevity is to its advantage; in five sentences, the poet employs original images and metaphor to explain what happens when trust is lost. Also to the poem's benefit is that the reason for loss of trust is not included, thus making the poem more universal in nature. The speaker opens with a description of the nature of trust. Described as a "shiny crystal sheet of glass," and "not something to take advantage of," trust is determined to be beautiful and easily breakable; its loss can bring a sense of betrayal. Next, the speaker describes trust as something that cannot be easily repaired, but can be if the betrayal is not significant. The poem compares loss of trust to "a little girl's pig-tailed doll, / that, when her brother tears its head off, / can easily be replaced." This rather violent image is important here; it not only establishes a destructive way that trust can be broken, but also demonstrates that even this extreme breach is reparable. Because of the speaker's loss of trust and its unreparability, one wonders what kind of broken trust the speaker experienced if it is worse than this. Astutely, the poet does not explain what this might be. You almost never get it back. It disappears down a road of no return. This direct statement followed by an apt metaphor is vital to understanding the pain of broken trust. That trust "disappears down a road of no return" is a final, unchanging outcome of that trust being destroyed. 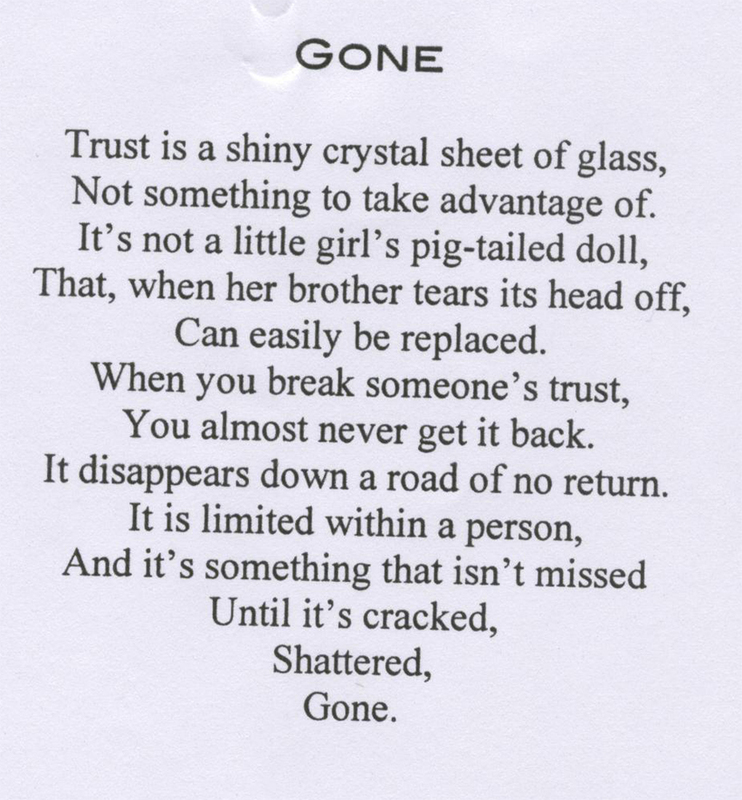 Just as one would sweep away broken glass and dispose of it, this poet is saying that trust is also similarly discarded when broken. Of course, one has to be careful with broken glass; the "cracked" shards can hurt. Also, the placement of "Shattered" and "Gone" on single lines is so appropriate to their importance in the poem. In its brevity, this poem is remarkable regarding what is said and, more importantly, what is not. The clear definition of broken trust and its outcome is related in thirteen lines, some as brief as one word. This admirable little poem will stay with this reader for some time. Thank you for the privilege of reading your work.